Giving out ornaments as a Christmas gift is one of my favorite things in the world. Making tree ornaments and then giving them out as gifts is even better! I use them for name tags on bigger gifts, or decorations on boxes of cookies, even just stand alone they make unique and personal gifts. My all time favorite ornament to make are swirly ones, as Ladybug says. I don’t have a better name for them than that. The name says it all. They are ornaments that are indeed swirly. They are so unbelievably simple, look extremely elegant, and the kids can do it. First go to your local hobby store and procure yourself some clear glass ornaments. They come in tons of sizes and shapes. My favorites are the cubes, and the traditional spheres or ball shaped ones. Pick out your favorite colors in acrylic paints. That was the hard part of this craft. Honestly. Once you are ready remove the tops off the ornaments. Grab your paints and put random drips of paints down the sides. Alternate the colors, vary the thickness. Let the kids do it! Then wait. About an hour later rotate the ornaments a touch. The paints begin to mix and swirl together. 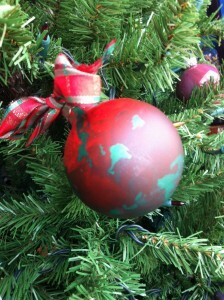 Just continue to rotate the ornaments in all different directions until all the paint has dried. Replace the lids (I generally use a touch of super glue on this touch to ensure they stay together) To finish the ornament pick out a coordinating ribbon and tie it on top. Or tie it to another gift. Take a paint pen and write someone’s name on it and the year. Wrap it in some tissue paper and a festive bag. And my most favorite thing to do with them, decorate my entire tree with them!